Homes sales in Ironwood and Ironwood West subdivisions may be struggling to keep pace with the overall real estate sales trend in Champaign County but being compared to a 13% increases would be rough on anyone! Ironwood and Ironwood West are keeping pace with last year’s sales and potentially creating a foundation for future home values in the neighborhood. This graph illustrates the Average Sale Price for the prior 3 months (August 20 thru May 20th) and 12 months (August 20th 2012 thru August 20th 2011). 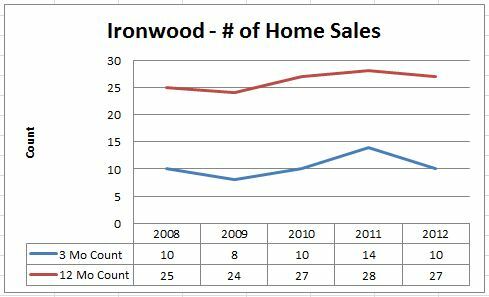 There have been 27 closed sales reported in the Champaign County MLS over the past 12 months in Ironwood (for the purposes of this post I combined the home sale totals of Ironwood and Ironwood West). This is one less than 2011 and even with 2010. 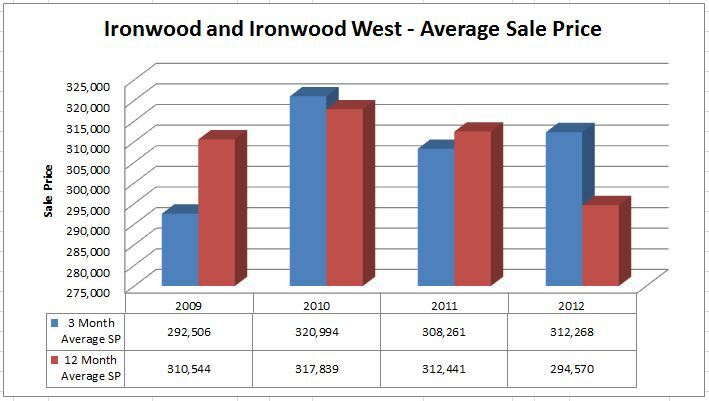 The average home sale price in Ironwood and Ironwood West for the same period is $294,570. This number is down a bit from the last few years and influenced by the increase in home sales on Joseph, Allison and Savanna in the SW corner of the neighborhood. These homes are slightly smaller than the average property and have a lower sale price to match. The total number of home sales remains relatively flat for this area. The 3-month trend fluctuates more and coupled with the 3-month increase in DOM (days on market) it may be pointing to a slightly slower fall season but we’ll have to wait and see. 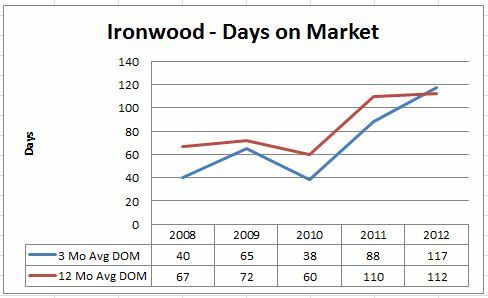 In general, what I see from the past 3 and 12 months of real estate sales in Ironwood is a surprisingly steady environment for home sales. I think the average sale price for the area may be coming down a bit due to smaller homes this year. Not an overall decline in the property values. If home sales keep pace with last year we should see things line up for a steady winter and very active Spring 2013 real estate market. 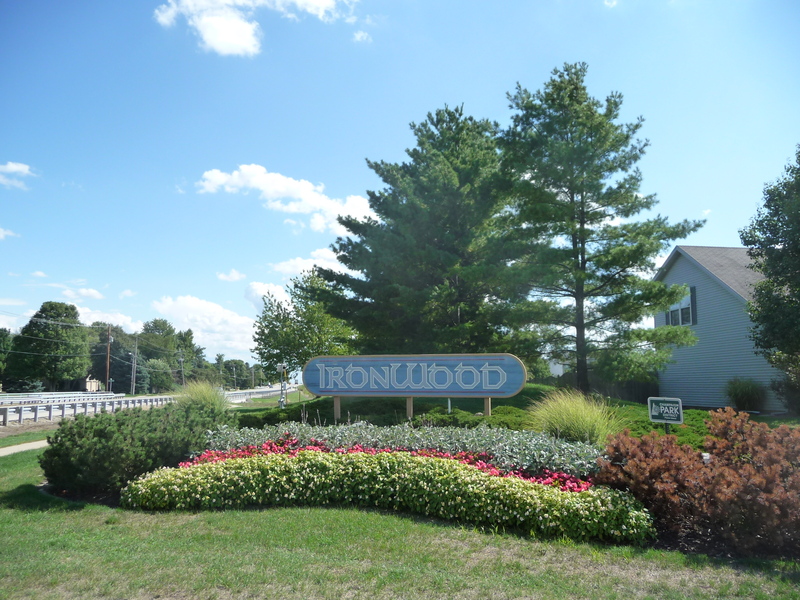 Thinking of a move to Ironwood or SW Champaign? Check our library of market updates for more info on the area or contact me or call 217-239-7114 to get more info. We have helped numerous homeowners buy and sell in Ironwood and would be happy to show you how.